The quintessential safari tents, with thatched roofs and large, mesh-screened windows, provide the perfect opportunity to connect with the sights and sounds of nature. With a choice of twin, double, or triple accommodation, all tents are equipped with en-suite bathrooms with solar-heated showers, ample cupboard space for your gear, and a cultural touch of local textiles. The five circular bungalows, built in a similar style to the Maasai boma, offer a more spacious option for family and triple accommodation. These airy rooms are situated near a large watering hole, creating the opportunity to watch wildlife from your shaded verandah. 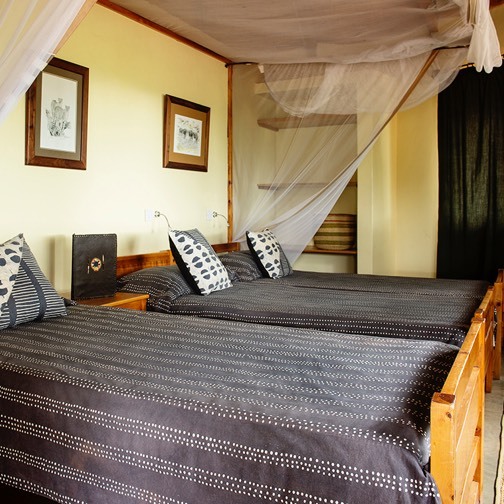 The bungalows are set away from the main lodge, providing privacy, and all are equipped with large en-suite bathrooms with solar-heated showers, and comfortable bedding made from local textiles.